Citrus and Fish are two ingredients that go perfect together. 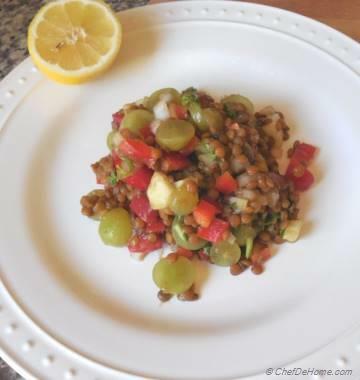 Like chef Robert Irvine says, "fish is no fish without a splash of lemon." 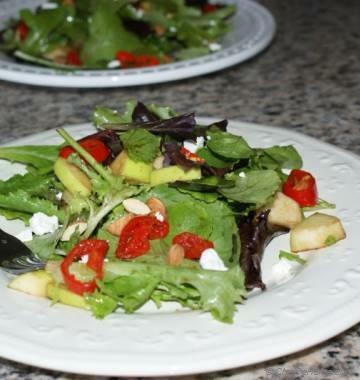 Amazingly, one is low in fat (fish) and second help reduce fat (citrus). Citrus fish is most welcome any day in my home. Especially during spring-summer season, fresh and tantalizing Cod fish dinner is our favorite way to end the day, an easy way. Just under 25 minutes, you can serve delicious fish dinner with some bread and/or salad on the side. Cod is a lean variety of fish and cooks very quickly. 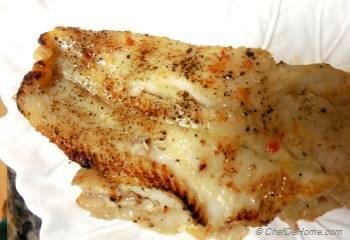 I often prefer pan-seared or broiled Cod fish rather than grilled. 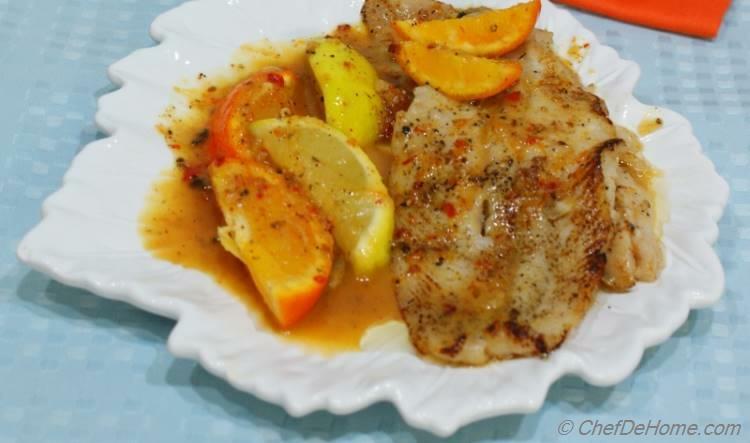 Even though Cod fish is my personal favorite, you can use this citrus sauce over any other grilled fish too. Choose a more sturdy fish if you planning to grill like Halibut or Salmon instead of Cod. Recipe calls for 1 tsp agave syrup. 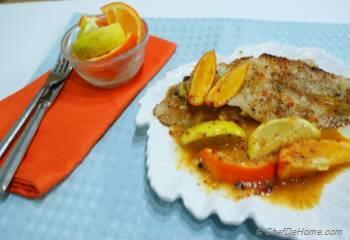 Sweetness of agave balances the tangy citrus sauce, heat of chili paste, and complements the fish. However, you will not taste sweetness of agave in the sauce. Use of agave is totally optional. In-fact, if orange you using is sweet, feel free to skip the agave. Or If cannot find agave, use regular 1 tsp white sugar or honey. 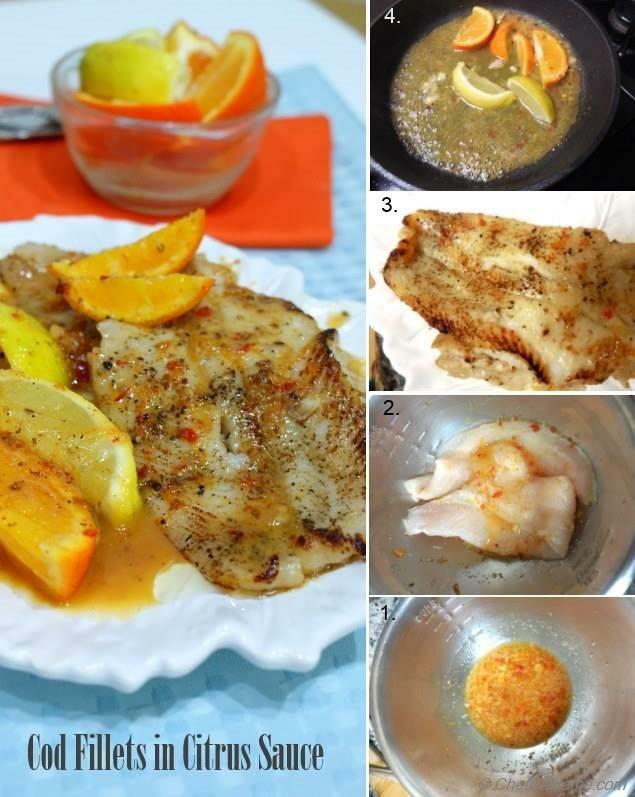 Cod with Citrus Sauce is an excellent and flavorful way to include some lean protein in family's diet. 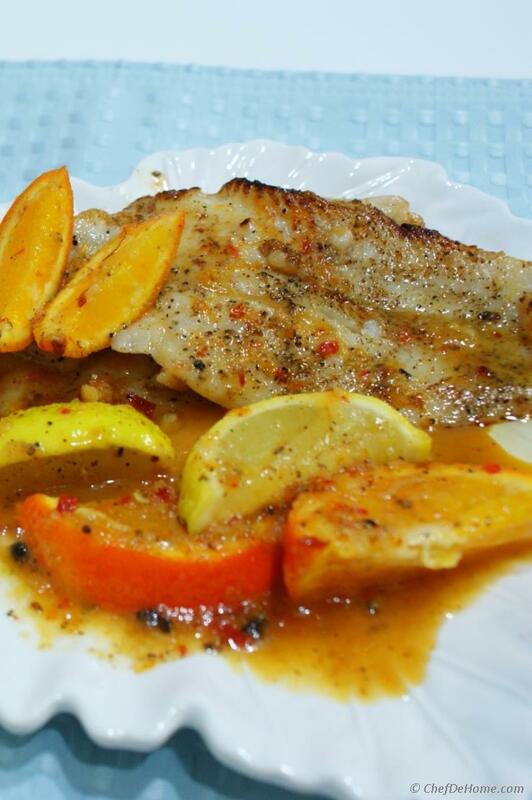 I am glad to share this easy fish recipe with you. 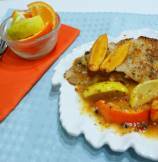 Some steamed rice or a lite citrus salad with this lean citrus fish will make an excellent weekday dinner. If in hurry, broil the fish and in meantime ready the sauce in a pan. 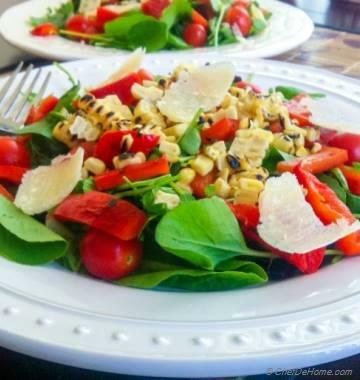 Serve homemade, healthy , scrumptious, and lite dinner in no time. Smart Swap Use Sparkling Tangerine Or plain Orange Juice instead of wine for wine-free version. 1. 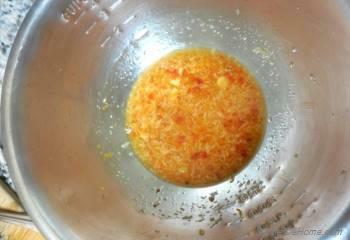 Make Marinade - In a small bowl combine white wine, agave syrup, ginger, garlic, chili paste and juice of half orange. 2. 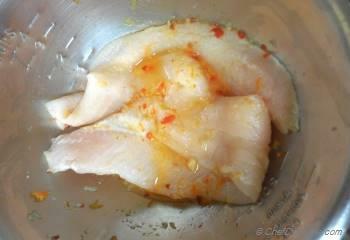 Marinate Fish - Pat dry cod fillet and add them to the marinade. Leave aside for 5 minutes. 3. Cook - Heat half tablespoon oil in a non-stick pan. Remove code fillet from marinade (reserve the marinade). Pat dry fillet with paper towel. Season with pinch of salt and fresh ground black pepper. Sear them 2 fillets, season side down for 2-3 minutes (on high heat) until brown on the first side. Turn the fish with wide metal spatula and cook the other side until browned (2-3 minutes). Add 1/2 tbsp oil and sear remaining two fillets. 4. Sauce - Transfer the fish to a serving plate. 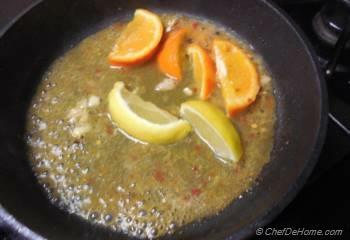 Meanwhile, place the orange, lemon wedges in the pan (heat on), add the reserved marinade and bring to a boil. Simmer the marinade for additional 2 minutes.